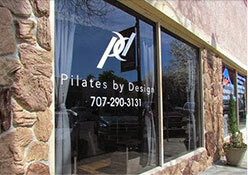 We have 45 Pilates Classes available to fit any schedule! Combining the toning action of Pilates with the cardio of a dance class, Barre mixes ballet and Pilates for a heart pumping workout set to music! A whole body workout designed to target all the major muscles groups, this class is designed to get you sweating and having fun! Combining traditional mat exercises with straps, springs and bars attached to a trapeze, the Cadillac helps stretch, lengthen and tone the body. 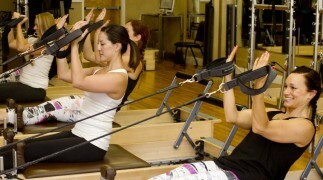 Using springs, straps and pulleys for assistance and resistance the Reformer offers an exercise experience that is low impact and great for toning and strengthening. Add some cardio into your workout by adding the jumpboard! A rebounder attached to the end of the Reformer, the attached springs take gravity out of the equation to lessen the stress on the joints allowing the muscles to really work and to get your heartrate elevated! Using springs of varying resistance attached to pedals, the chair offers an energetic workout that tones and strengthens the body with a large variety of exercises. Primal Pilates or Primal Foundations is an explorative mat based class, that follows the progressions of our early motor development teaching the fundamentals of human movement.